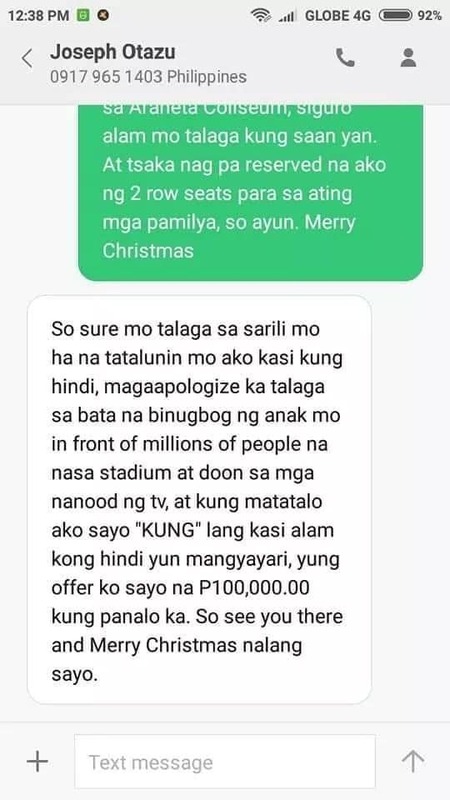 Ito ang kumakalat sa social media, na tinanggap na umano ng ama ni Joaquin Montes ang bully kid ang hamon ni Joseph. 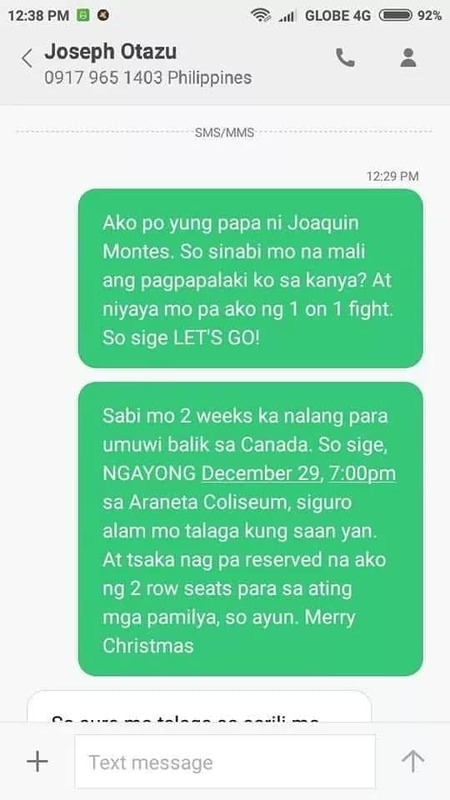 Noong isang araw lamang ay hinamon ng isang Isang Filipino Canadian veteran army na nasa pilipinas ngayon at nagbabakasyon ay gustong makipag kita sa ama ni Joaquin Montest, ang tiniguriang the Bully Kid dahil sa gusto nitong makipag one on one match. Joseph Perez Otazu, a combat soldier who got deployed in Afghanistan, expressed his disappointment over the attitude of Montes towards his fellow students in Ateneo. He said that hes a father and also can relate to the feelings of the parents of their children who got victimized by Montes. Otazu believes that Joaquins parents are the one who must be blamed for letting their child have this bad behavior. I dont really blame the kid for that for that kind of behavior, I blame the parents for that, Otazu said. Its up to you as a parent to control your kids, teach your kids respect and alam mo naman yan kung if your kid is exhibiting that kind of behavior, its up to you to correct your kid, he added.